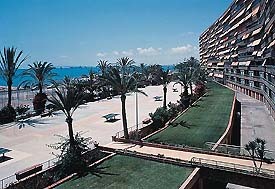 The Albahia Hotel is located a bit north of the city center of Alicante. We once had friends over, who spent some days at the hotel and where very happy with it. Being a 3 star hotel, it is located on 2 floors of a larger building next to the northern beach of Alicante. You can check pricing and availability here. Well don’t expect a sandy beach there, its a bit rocky, but quite nice. The newly installed Tram (Alicante Streetcar) at the back of the hotel, can bring you fast and comfortable to downtown Alicante or to the northern sandy beaches of San Juan or Campello.